08-Jun-2003 -- This confluence is 9.6 km from the closest point on a driveable road. I started to walk where the old road from Nautijaur to Tjåmotis crosses the Nautasjokk river. Already after 250 m it was necessary to ford Addurbäcken river, which at this time had 40 - 50 cm water and was 15 m wide. After this I could follow a seldom used footpath, or nowadays rather a 4-wheel motorcycle track, for some kilometres. There the land was more or less flat with mosses and lichens and old pine trees and many grey trunks of fallen trees. After an hour the terrain became more rough. Some swamps were passed, and the land was rising. A whooper swan passed close. After 4.5 hour of almost continuous walking, I reached the confluence point. It is situated in a pristine, not very dense, highland birch and spruce forest with occasional pine trees. I recorded the elevation 551 m +-20 m. The weather was good, about 20 degrees celsius. I took photos in the four principal directions, but forgot to change the close-up setting on the digital camera after the GPS image, so the geographical images are quite blurry. I took similar photos with a 17 mm lens on a 35 mm slide film. Therefore I submit only two images from the point itself (digitally sharpened), and I hope to be able to submit sharp images some time in August, when the slide film is processed and digitised. I walked back a slightly longer way (11 km) past a reindeer herder's cabin. It took me 5 hours to get back to the starting point. I made an attempt to reach this point 3 weeks earlier, following an old footpath that started in Nautijaur and which would pass 5 km east of the confluence point. Actually I started from the end of a logging road 500 m west of the footpath and about 5 km northwest of Nautijaur. The footpath was no longer used by footwalkers, only by skidoos. 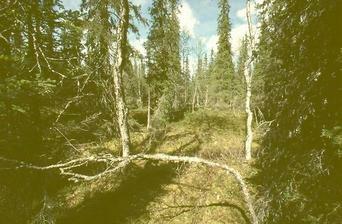 The skidoo track followed bogs, while the footpath could not be found any more for long distances. After 6 km I reached Nautasjokk. I could not get over it, because the snow was melting and the current in the stream extremely strong. The old suspension bridge was only some wrecked poles and a rusty cable on the ground. Then I was more than 6 km from the confluence point and had to turn back. Birdlife was intense, so it was quite an interesting tour. I also checked Addurbäcken, which was too big to be waded at this time of the year.